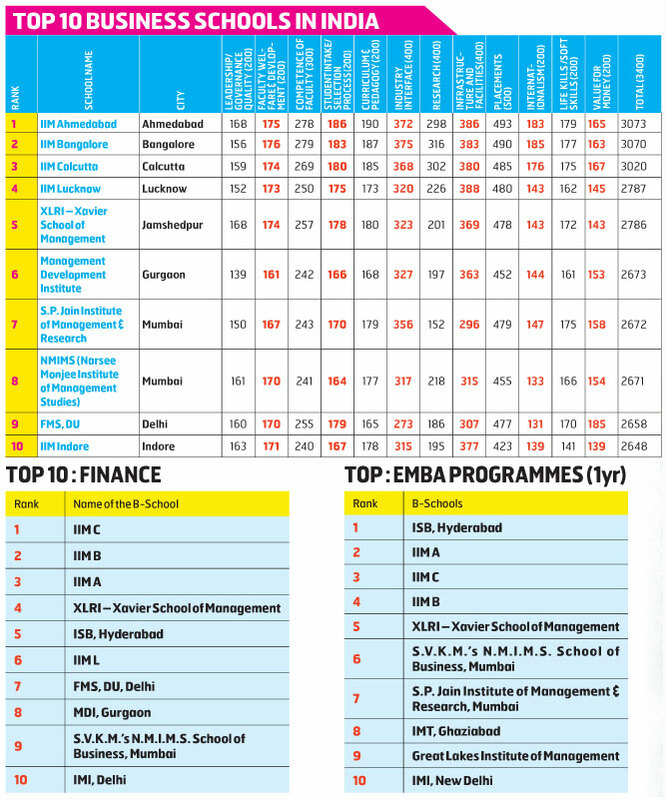 A glimpse of Annual B School rankings that emerged from a survey done by C fore in association with BW Businessworld. One of India’s first public autonomous institutes of management education, requires no introduction. It has been recognised globally as a top-ranked institution and has consistently delivered on its promises to churn out graduates with exceptional managerial skills equipped to handle the dynamic business world. Established in 1961, the institute offers diplomas through their two-year PG programme in management, two-year PG programme in agri-business management, fellow programme in management and a one-year PG programme in management for executives. The third IIM to be established in the country, IIM Bangalore has come a long way in the last 42 years. The four cornerstones of the establishment that have given it its current stature are developing a world-class research and teaching ecosystem, leveraging technology, creating a global perspective and infusing an entrepreneurial mind-set among its students. With a strong academic system and world-class research, IIM-BangaloreBangalore is the breeding ground for good managerial candidates in the country. IIM aspirants tend to pick IIM-B for its access to and year-round interactions with the telecom, IT, aviation, manufacturing and SME sectors. Like IIM-A, this institute is also EQUIS accredited. Currently helmed by Sushil Vachani as its director, the institute has stuck by its resolve to innovate. Among its noted alumni are Dr K Radhakrishnan, former Chairman of ISRO, author Ravi Subramanian, Damodar Mall, CEO of Reliance Retail and Rajiv Srivatsa and Ashish Goel, founders of Urban Ladder. India’s first Institute of Management has been instrumental in establishing an Indian brand that identifies with quality management education and research. Set up under the purview of Ministry of HRD, the workings of the institute are overseen by the board of governors. Established in 1961, IIM Calcutta boasts of a beautiful campus in Joka spread over 135 acres of land interspersed with seven lakes. Yes, it’s the perfect environment for what is perceived as a high pressure course and a chaotic city. Its one-year Post Graduate Programme in Management is a residential programme that has been offering a globally recognized, continually evolving business environment to academia, students, industry and researchers. As a public autonomous institute of management, it was set up as a joint effort of the government, Alfred P Sloan School of Management (MIT), the Government of West Bengal, The Ford Foundation and most importantly, the Indian industry, which continues to support and inspire institute that is preparing students for the changing dynamics of the business world. It will be difficult to find a better environment to learn and excel in. The Indian Institute of Management Lucknow (IIM-L) campus is spread over 185 acres spread and provides its students and faculty tranquil surroundings at Prabandh Nagar, on the outskirts of Lucknow. The environment is not only an incentive for academic progress, but also gives students an opportunity to unwind and pursue a variety of extracurricular activity. IIM-L is also probably the first IIM to have taken the lead in establishing a satellite campus at Noida in the National Capital Region. The new campus has a full-time dedicated pool of teachers and both students and faculty live on campus. The campus has been developed as a centre of excellence in the area of executive education. “It is our way of contributing to the industry and realising its vision to remain at the forefront of management thinking and education,” informs a spokesperson at IIM-L. The school has graduated from the era of trade unions and management training to offering courses that have groomed the best professional talent the country can boast of in the field of human resources. Today the institute also offers post graduate diplomas in retail, IT and business administration. XLRI stands out as it continues to produce administrators, who not only have polished their capabilities to the fullest potential, but who are also equipped to be agents of change. Being one of the top B-Schools of the country, the institute has the distinction of being the first internationally accredited Indian B-School. MDI received accreditation by South Asian Quality Systems (SAQS) in 2005. The institute’s longterm education programmes are accredited by the Association of MBAs (AMBA), UK, and all its PG programmes in management are recognised and accredited by the All India Council for Technical Education (AICTE), New Delhi. Management education in India is traditionally based on the American model that essentially focuses on tools that can address structured problems. “But we are now getting into a VUCA (volatile, uncertain, complex and ambiguous) world, where traditional management curriculum won’t help in providing the skill set to resolve such structured problems,” points out Ranjan Banerjee, Dean, SP Jain Institute of Management and Research (SPJIMR). Banerjee goes on to add that today, to match up to the requirements of businesses in the country and across the globe, the institute is embedding design thinking in its curriculum, to encourage students to have the skill set to solve badly restructured problems. “This requires a mix of class room and out of class room learning,” he says. SPJIMR by the Bharatiya Vidya Bhavan has grown rapidly in eminence since it inauguration in 1981 to become one of the top ten B-schools in the country. “The bold move to move away from University of Mumbai, to have freedom in course curriculum, pedagogic innovations and pioneering programmes in socially under-managed sectors was the beginning of our journey to achieve the mandate,” says Banerjee. Since then, the institute has maintained a consistent record of recognising the needs of society, especially the under-managed sectors, and responding quickly and appropriately. “Innovation is in the DNA of the institute,” says Rajan Saxena, Vice Provost - Management Education and Dean-School of Business Management at Narsee Monjee Institute of Management Studies. That is why NMIMS is different from other management schools. He gives the example of the first ever PGDM programme with a focus on international business which was launched in 1993. “This was subsequently followed by programmes in advertising and communication management, rural management and other sectoral programmes,” he adds. After receiving Deemed to be University status in 2003, the institute has grown tremendously, and at present has 10 schools offering courses across various disciplines such as management, technology, science, pharmacy, law, business, economics, architecture and commerce at graduate, postgraduate and doctorate levels. “The programmes offered are a mix of core courses such as MBA and BTech and innovative industry-oriented courses like MBA Pharma Tech., MBA Pharmaceutical Management and MBA HR. The institute also has highly flexible distance learning programmes in which the emphasis is on self-paced learning,” informs Saxena. NMIMS is one of India’s most respected private B-schools. It ranks among the top 10 business schools in India and boasts of over 12,000 students and 450 faculty members. For over three decades now the institute has been playing a pivotal role in the augmentation of corporate-management studies. It has also actively engaged with industry, alumni, global management schools, accreditation agencies, management consulting firms, forecasters etc., to bridge the gap between knowledge and application of knowledge. “At the Faculty of Management Studies, the focus is on management education more than just business management. The commitment is thought leadership with a deep understanding of business,” says M.S. Singla, Dean, Faculty of Management Studies (FMS), University of Delhi. However, Singla points out that there is more to the institute than what is taught within its confines. FMS has the unique privilege of being part of one of the premier universities in the world — the University of Delhi — with some of the finest departments in economics, law, sociology, commerce and operations research. “Our collaborative approach which involves inputs from various departments gives us the benefit of a much wider view and deeper understanding,” he says. IIM, Indore established in 1996, almost 34 years post the first IIM, has catapulted itself to rank among the top 10 B-schools in India. It is the sixth in the family of state-supported management schools. Since its inception, it has been a leader in the field of management education, interfacing with the industry, the government sector and PSUs. This is the only IIM that apart from providing a broad array of programmes within its campus, also offers a Post Graduate Programme in Management at its Mumbai campus in Belapur.